NOTE: If you want manually locate and change the source data, go to the pivot table source data page. If you have multiple pivot tables and lists in an Excel file, you might need to identify which data source each pivot table uses. The following code checks for at least one pivot table in the workbook. If there aren't any pivot tables, the macro stops. Otherwise, the macro adds a new worksheet to the workbook, and lists all the pivot tables, their sheet names, and their data sources. NOTE: If the source data is not found, for example pivot tables added to the Data Model, the Source Data shows as "N/A". If strSD = "" Then strSD = "N/A"
If your workbook includes OLAP-based pivot tables, you can show the MDX query, instead of the Data Source. The following code checks for at least one pivot table in the workbook. If there aren't any pivot tables, the macro stops. Otherwise, the macro adds a new worksheet to the workbook, with a list of pivot tables, and their data source (non-OLAP), or MDX query (OLAP-based). If you want to change the data source for all the pivot tables in a workbook, based on a named range, you can use the following code. 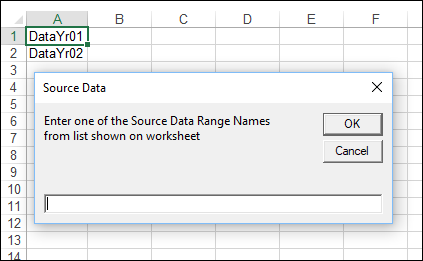 This could be used, for example, if you have changed the original data source into an Excel Table, and you want to use a named range that is based on the new table. The macro adds a sheet to the workbook, with a list of named ranges that are in the workbook. Next, the macro prompts you to enter one of those names, to use as the new data source for all the pivot tables. NOTE: This macro will change the source data for normal pivot tables only. It cannot change OLAP-based pivot tables, such as those that are added to the Data Model. 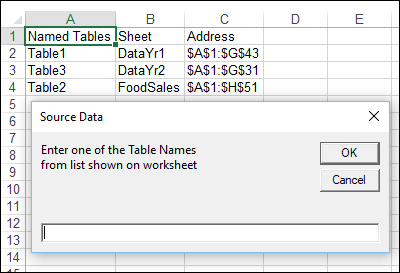 strMsg = "Enter one of the Source Data Range Names "
strMsg = strMsg & vbCrLf & "from list shown on worksheet"
MsgBox "Could not update pivot table source data"
If you want to change the data source for all the pivot tables in a workbook, based on a named Excel table, you can use the following code. 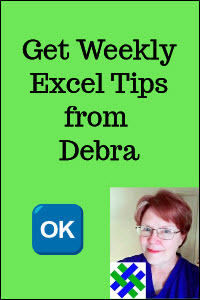 The macro adds a sheet to the workbook, with a list of named Excel Tables that are in the workbook. Next, the macro prompts you to enter one of those table names, to use as the new data source for all the pivot tables. MsgBox "No named tables in this workbook"
strMsg = "Enter one of the Table Names "
Download the sample file for this tutorial. The zipped workbook is in xlsm format, and contains the macros from this page. Be sure to enable macros when you open the workbook, if you want to test the macros.